An array of tasty topping recipes that are perfect for crunchy slices of bread. 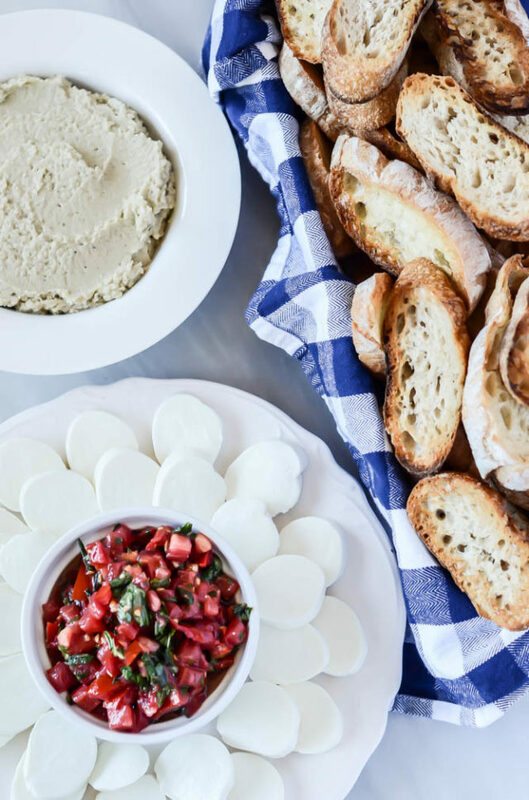 A Bruschetta Bar is the perfect spread to serve at your next get-together! Who’s ready for a party?? Because today I’m bringing you a fun, inventive way to serve up some light snacks to your next party guests – a homemade Bruschetta Bar! In all honesty, today’s post should only be considered the tip of the iceberg, because the possibilities are endless. 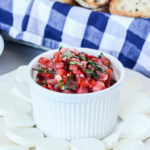 I’ll get you started with some of what I consider the “must-have” basics for any Bruschetta Bar, and then leave it up to you to get creative from there and come up with some of your own toppings. You could even add these Butternut Squash Crostini with Crispy Prosciutto and Sage or these Goat Cheese, Apricot and Pistachio Crostini with Honey to the spread if you really want to wow everyone. There are endless possibilities! As I mentioned in Monday’s post, I came up to the Bay Area last week for a friend’s baby shower. She’s due just a few weeks before me (another girl!) and I am so excited to be going on this journey with her. It has been great to have someone to talk to and compare stories with as we both experience pregnancy for the first time. It is a pretty big life change, after all! So when my friend asked if I’d be willing to help with some food for her shower, of course I jumped at the chance. She’s been having a little rougher time with morning sickness than I have, so I was sure to ask her what types of food were sounding best to her before planning the menu. I would hate to show up to her shower with a bunch of food that made her feel sick! After a little discussion back and forth, we decided on a Bruschetta Bar. We thought it would be the perfect “light snack” to have available for a mid-afternoon shower, would hold up well in the heat (this was an outdoor shower in the month of August, after all) and actually sounded appetizing to her. So how do we create a Bruschetta Bar?? 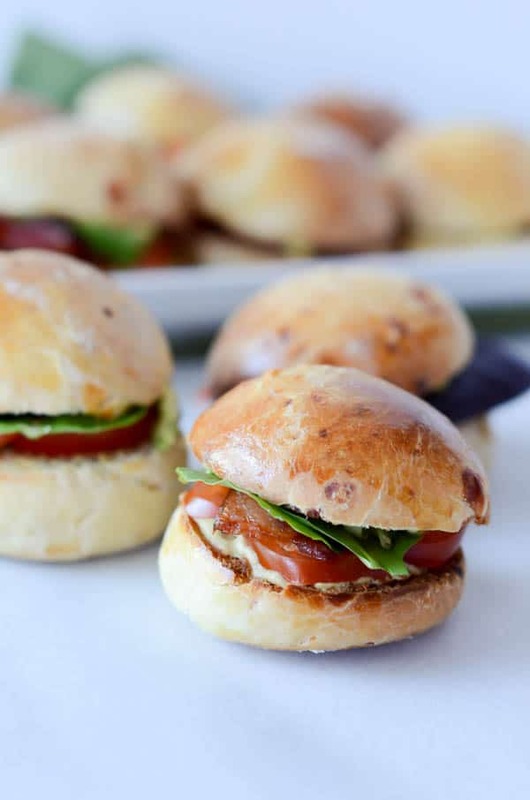 Well, my friends, it is incredibly easy (like, you’re going to smack yourself in the forehead after reading this if you have never thought of serving a Bruschetta Bar at a get-together before.) 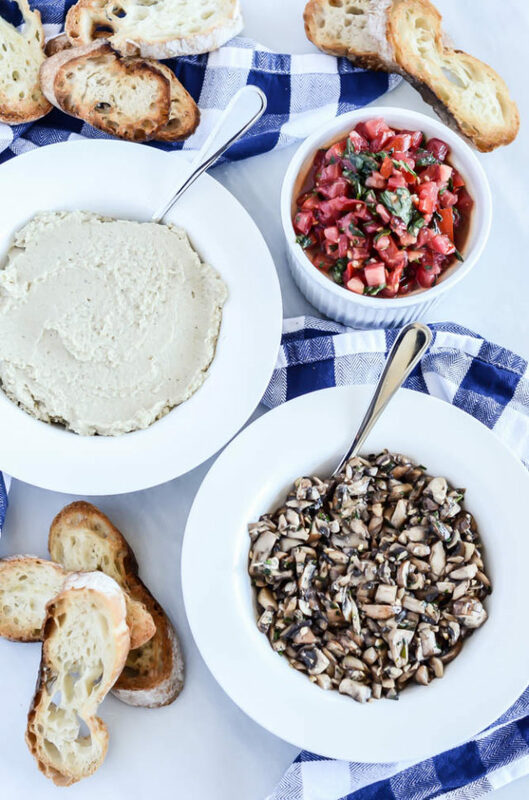 You simply put out a bunch of different topping options (or, better yet, have your friends each bring a topping, potluck style), toast up a big batch of crostini and set it all out for your guests to go to town. That’s it, no last-minute frantic rush in the kitchen or need to dish out plates for your guests. My favorite kind of entertaining! Each topping is incredibly easy to make, with minimal ingredients and not a lot of cooking required. At first glance it may seem intimidating, but I promise you it’s a breeze to throw together. You can also prep a lot of the toppings ahead of time, which means less pressure on you to be in the kitchen and more time to sit and enjoy the company of your guests. Read on for the topping recipes, toast up some crostini and be sure to tell me about some of your other favorite variations in the comments below! Fresh tomatoes, garlic and basil come together to form the perfect topping for golden crostini when paired with creamy mozzarella. Add all ingredients to a large mixing bowl and stir to combine. For best results, refrigerate for at least an hour before serving. Serve in a bowl with a platter of mozzarella alongside. 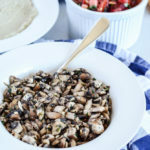 Finely chopped mushrooms sauteed in olive oil with a touch of fresh tarragon make the perfect addition to a fun Bruschetta Bar. Add oil to a saute pan over medium heat. Once oil is warm, add mushrooms, stirring over medium heat until they begin to sweat. Add tarragon and garlic and continue stirring until mushrooms are cooked through. Squeeze in lemon juice and add salt and pepper to taste. Serve warm or at room temperature. 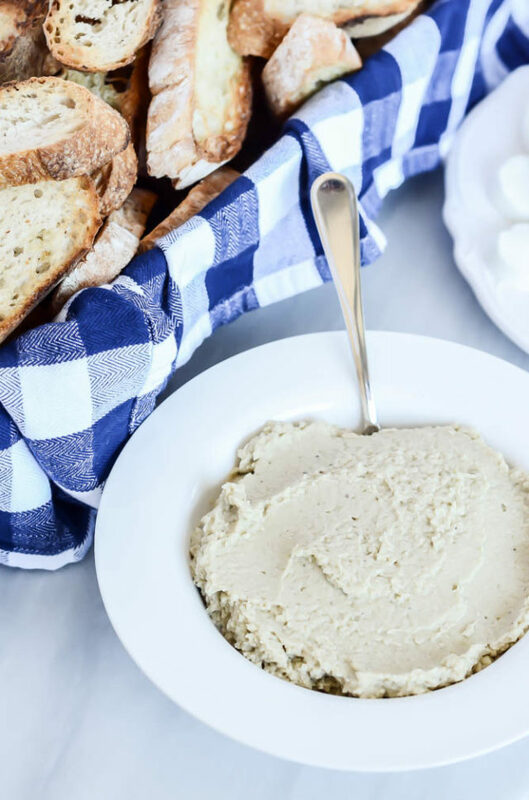 Roasted eggplant and white beans come together to form a smooth, silky spread that is perfect to spread on toasted crostini. Preheat oven to 400 degrees Fahrenheit. In a medium mixing bowl, toss together the eggplant, garlic, olive oil, ½ teaspoon salt and ¼ teaspoon pepper. Spread mixture out on a parchment-lined baking sheet and roast at 400 degrees for 20 minutes. Remove from oven and let cool slightly. 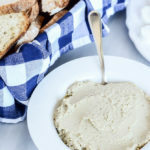 Add roasted eggplant and garlic, cannellini beans, olive oil and lemon juice to the bowl of a food processor and process until a smooth puree forms. Add salt and pepper to taste, pureeing between each addition to incorporate. For best results, refrigerate for at least an hour before serving. 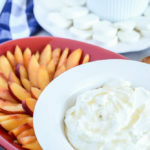 This sweet, tangy and creamy spread is delicious when paired with fresh nectarines and used to top crunchy crostini. Stir together ricotta, goat cheese, cream cheese and honey in a medium mixing bowl. Refrigerate for at least an hour before serving. Serve in a bowl alongside a platter of the freshly sliced nectarines. 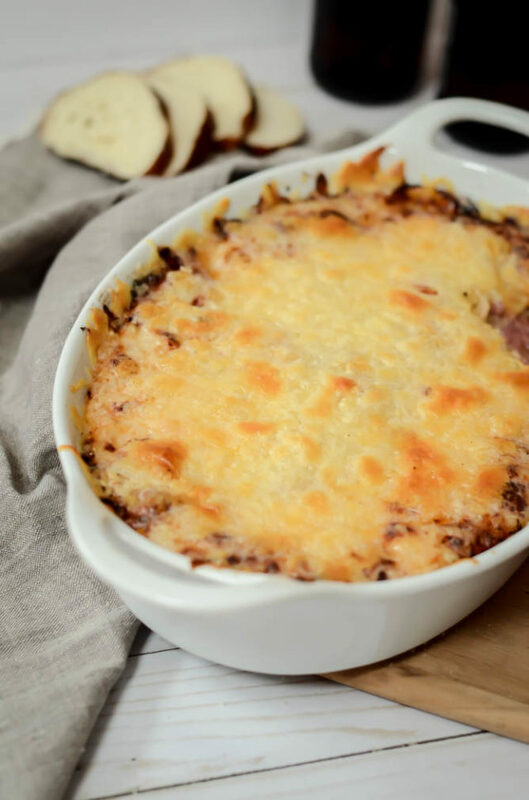 A cheesy, gooey, delicious dip made from all of the ingredients of a classic Reuben sandwich – Pastrami, Swiss cheese, sauerkraut and Thousand Island dressing! I’m on my way home from an amazing Bachelorette Weekend in Palm Springs with my gals (more to come on that later) but I queued this up to share with you because, guys, next weekend is Memorial Day weekend already! Can you believe it? It also happens to be my man’s 30th birthday this weekend (that’s right, the big 3-0!) so you KNOW we will be doing plenty of celebrating and eating of all the foods. This here Reuben Dip will definitely be in rotation, as it’s one of our favorite guilty pleasures. So, I have to confess, I actually stole (well, borrowed…“stole” seems like such a harsh word!) this recipe from my gal pal, Stephanie. 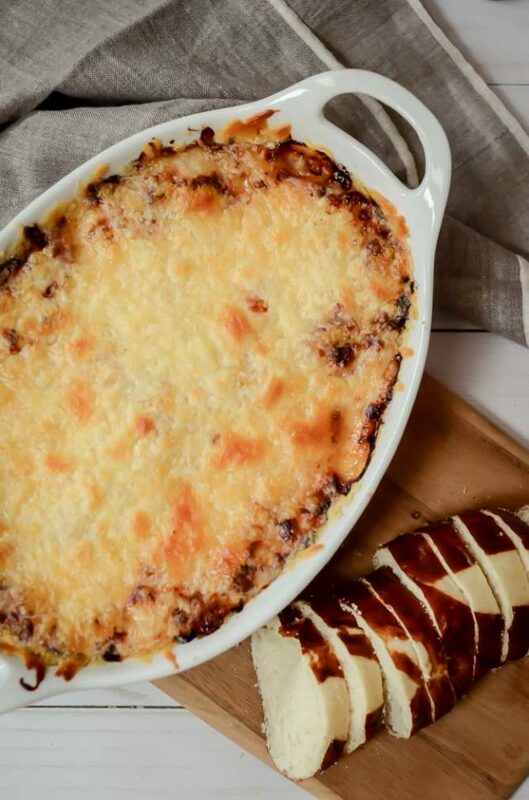 Stephanie and I worked together in Napa, and this dip would be the most-requested dish of any party she would be attending while we lived there. It is so delicious and, even better, SO simple! She would walk in with the steaming casserole and the crowds would go wild. No, literally, I am not even exaggerating. Ever since I convinced her to share the recipe with me (after we moved to different cities, of course, because no way could I steal her star-of-the-show party dish from her while we were attending all of the same get-togethers), I’ve made this dish more times than I care to admit. It is so good and so addictive and no, you can’t stop at just one dip. I dare you. Imagine my excitement when Chris returned home from his Bachelor Party with two massive packages of leftover pastrami. We quickly popped said packages in the freezer so we could enjoy Reuben Dip to our little heart’s content for months to come. There will be no shortage of Reuben Dip around these parts for the foreseeable future! The process is simple: we combine all of the good things that come on a classic Reuben sandwich (pastrami, sauerkraut, Thousand Island dressing, Swiss cheese), mix them up real good, top them with even more cheese (I never said this dish was healthy) and bake it all in a casserole dish or glass pan until the top layer of cheese is bubbly and golden. We then proceed to dip ALL of the dippers (the classic choice would be Gardetto’s rye chips, but I can never find those at a normal grocery establishment so I’ve been known to substitute pumpernickel pretzels and pita chips) until our Reuben dip is no more. Heck, if you really wanted to be a traditionalist, you could even scoop all of the deliciousness up with hunks of a crusty baguette. Is your mouth watering yet? I hope so, because you definitely NEED to make this Reuben Dip for whatever party or barbecue your attending this Memorial Day weekend. And if you’re banking on leftovers, you might as well just make two batches. One for me, one for you. 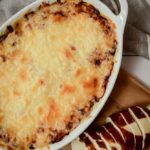 Or, you could always make one of these Memorial Day-friendly dishes to bring to your party and keep all of the Reuben dip to yourself! 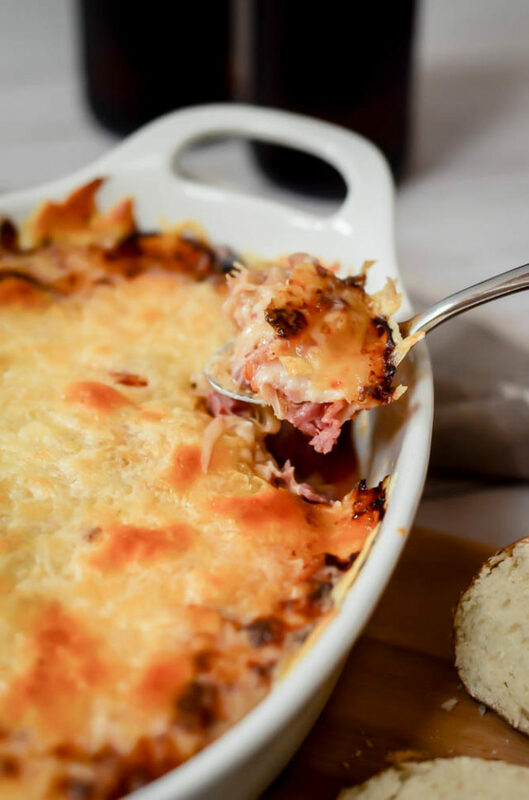 A cheesy, gooey, delicious dip made from all of the ingredients of a classic Reuben sandwich - Pastrami, Swiss cheese, sauerkraut and Thousand Island dressing! 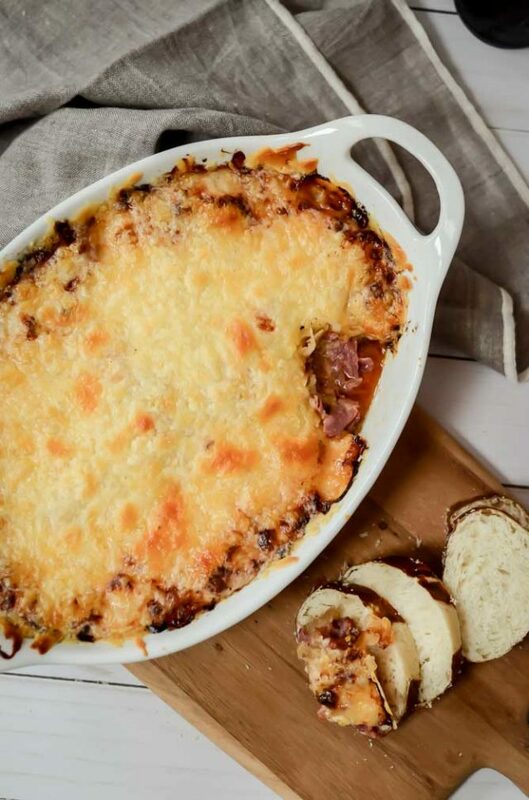 Combine meat, one bag (12 ounces) of shredded Swiss cheese, Thousand Island and sauerkraut in a small casserole dish. Mix to combine. Top mixture with second bag of shredded Swiss cheese. Place in oven and bake at 350 degrees for 15-20 minutes. Turn broiler on high and broil for an additional 5-7 minutes, or until cheese on top is bubbly and golden. Let cool slightly before serving. A bite-sized version of the classic sandwich. You can’t go wrong with bacon, lettuce, tomatoes and of course, avocado! Today I’m so happy to be bringing you these little bites of deliciousness. I don’t know about you, but I’ve always been a snacker. It might be a little bit obvious from some of my past favorite recipes (namely this, this and this), or maybe I just love food too much, but I’d rather sample little tastes of everything than have to stick to one entrée for my meal. In fact, I’m somewhat notorious in my family for stealing bites off of everyone else’s plates before finishing my own dish. My dad used to tell me that the calories don’t count if you didn’t order them, and I’m totally on board with that. 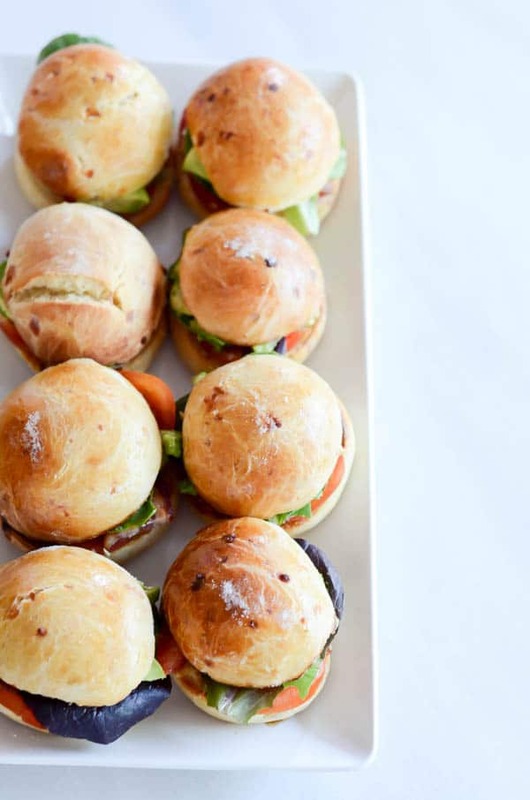 But enough of my snacking tendencies, and on to these BLT Sliders with White Cheddar Brioche Buns (say that ten times fast.) I know, they’re pretty self-explanatory, but let’s just pause for a minute and think about what we’ve done here. 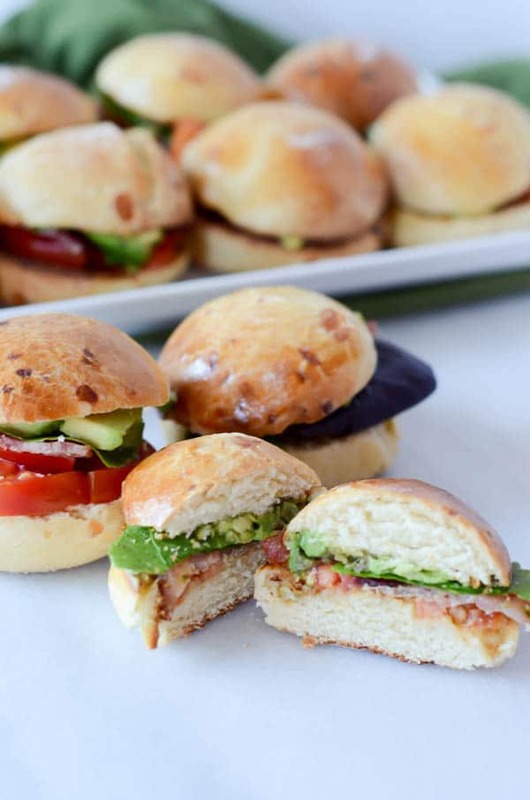 We’ve taken possibly one of the best sandwich creations of all time and turned it into a bite-size (well, maybe a couple of bite-size) version, and we’ve totally upped the ante by making homemade white cheddar brioche slider buns. You digging this yet? Let me spell it out for you: B-L-T S-L-I-D-E-R-S W-I-T-H W-H-I-T-E C-H-E-D-D-A-R B-R-I-O-C-H-E B-U-N-S. Are we all on the same page now? Good. Let’s get on with it. Truly, the only semi-challenging part about this recipe is the making of the buns. And if you’re patient and have a couple of hours (maybe three) to let the dough do its thing, you’ll have no trouble at all baking these puppies off and making a lovely, billowy, cheesy throne for your bacon, lettuce and tomatoes. 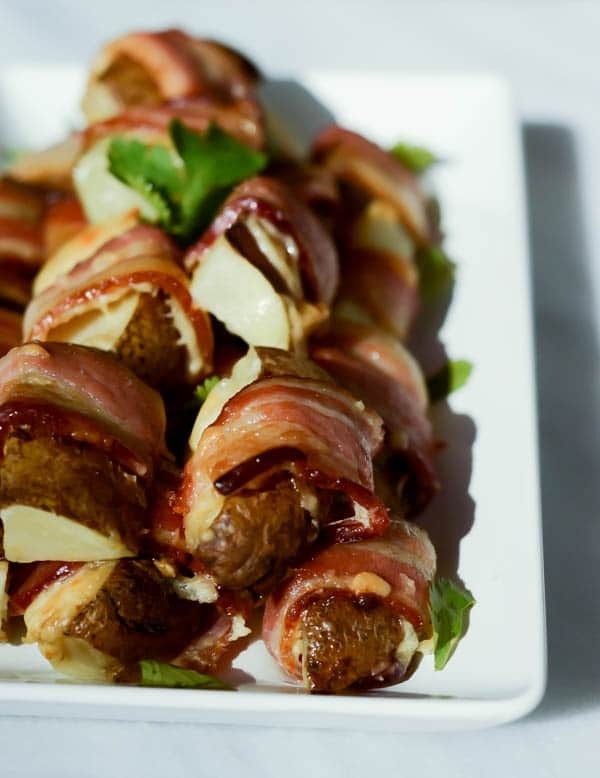 We’re all (at least barely) familiar with cooking bacon, right? (And if not, please take careful note of my no-fail bacon-baking method below so we can actually be on speaking terms again.) Good. Because that’s literally the ONLY additional cooking skill that this recipe requires. Guys and gals, once we get over the bread-baking hump, it is really that easy. We’ll have our cocktail party snack (or dinner, or children’s birthday party menu, etc. etc.) ready in no time at all. 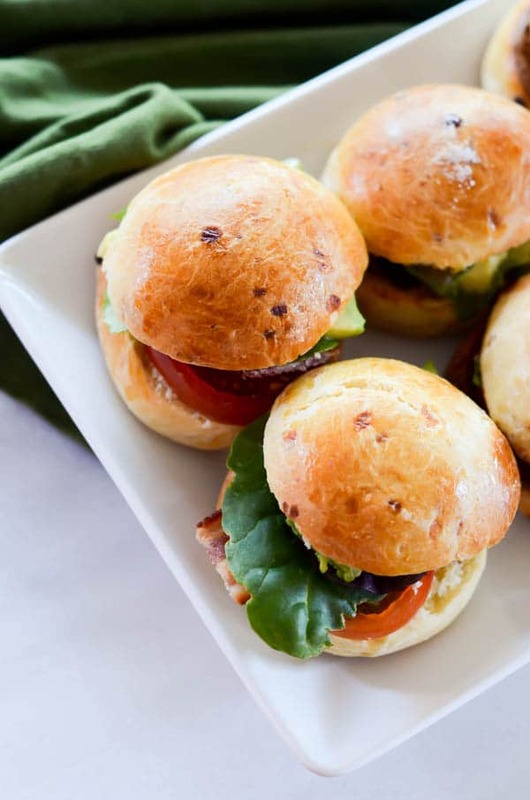 We simply adorn our buns and bacon with the classic tomato, lettuce, mayo, mustard and maybe some avocado (if you’re lucky/an avocado freak like me!) and we are all set! You could also add some scrambled eggs and call them brunch? 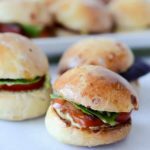 BLT Sliders with White Cheddar Brioche Buns to the rescue! My mind is just swimming with possibilities. But alas, we’re going to start with this simplest of simple version and if you’re lucky we’ll elaborate on the idea in the future 😉 So are you ready to get in the kitchen and start assembling these bad boys? What are your favorite “snacky” foods for nibbling? Anything you want to see me recreate as bite-sized? I always love hearing your ideas! A bite-sized version of the classic sandwich. You can't go wrong with bacon, lettuce, tomatoes and of course, avocado! Remove from mixing bowl onto a lightly floured surface and knead gently. 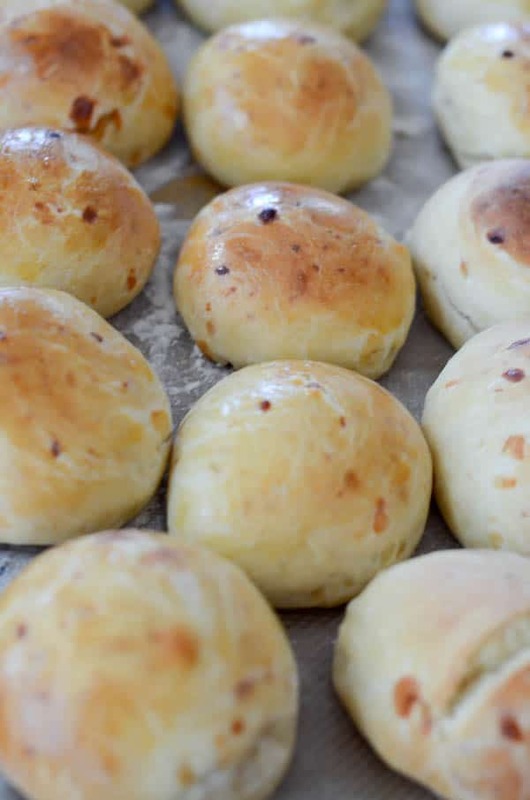 Separate dough into 12-15 portions (slider size!) Place on a baking sheet covered in parchment paper (or a silpat), cover and let rise again for one hour. Preheat oven to 400 degrees Fahrenheit. In a small bowl, use a fork to scramble the remaining egg, then brush it over the slider buns. Place in preheated oven and bake for 10-15 minutes, or until golden. 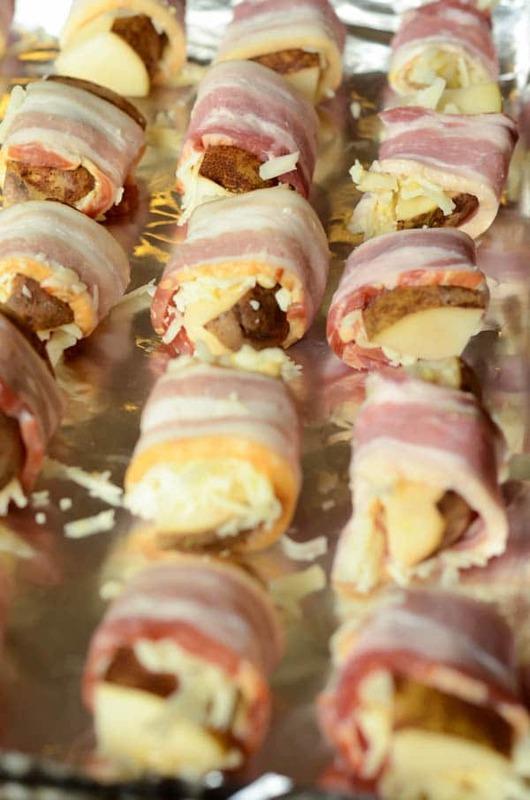 Remove from oven and let cool before slicing in half to assemble the rest of the sliders. 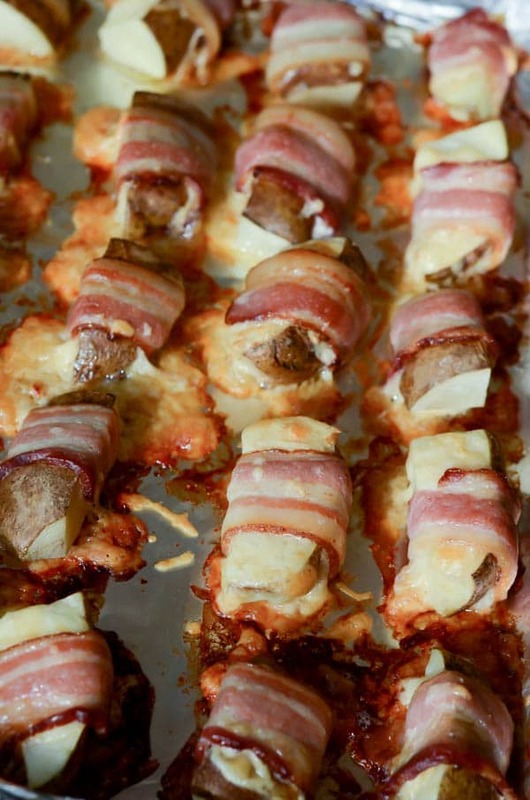 Place bacon slices on a rimmed baking pan covered with aluminum foil. Place in oven and turn oven on to 400 degrees Fahrenheit. Set a timer for 20 minutes. 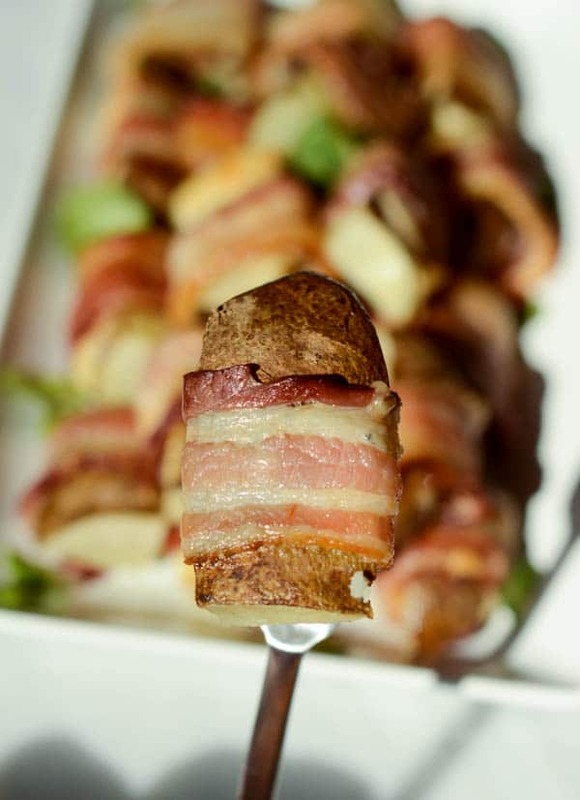 The bacon cooks perfectly as the oven preheats, and when the timer goes off it will be perfectly cooked! Remove from pan onto a plate covered in a paper towel. Once cool, cut each slice of bacon into thirds. 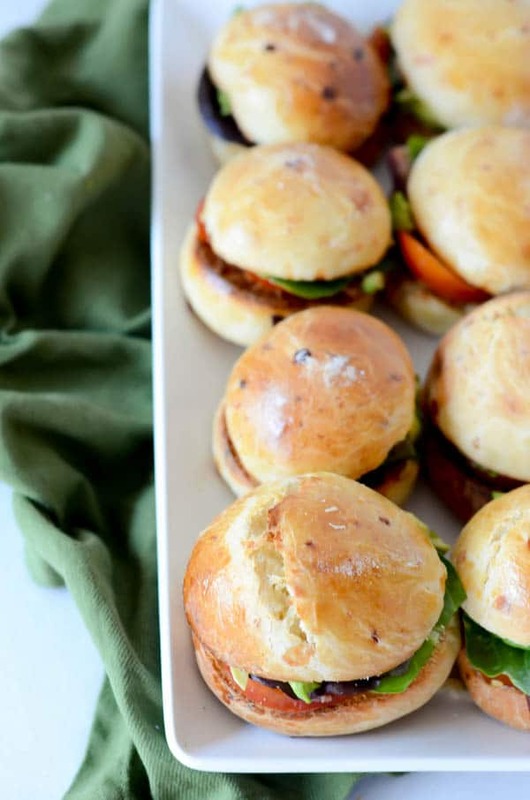 With slider buns cut in half, spread about 1 teaspoon mayonnaise and 1 teaspoon mustard on either side of each bun. 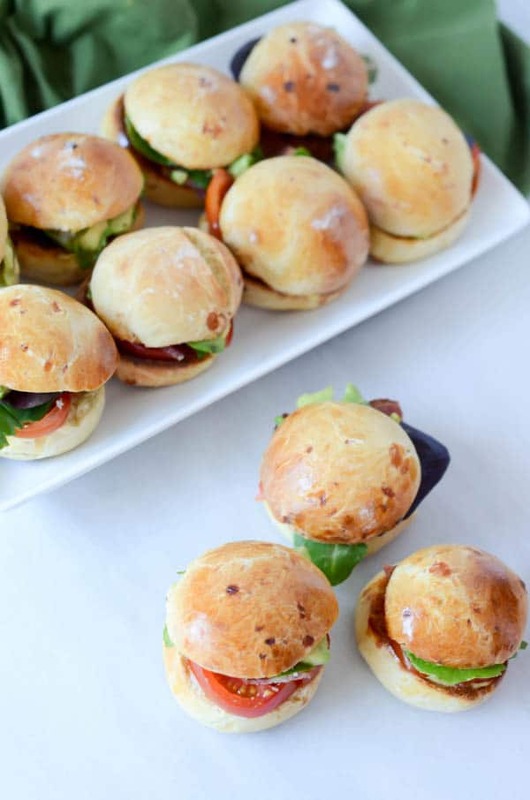 Carefully stack bacon, tomato, lettuce and avocado on top of bottom half of each slider bun. Top with other half of slider bun. Enjoy! 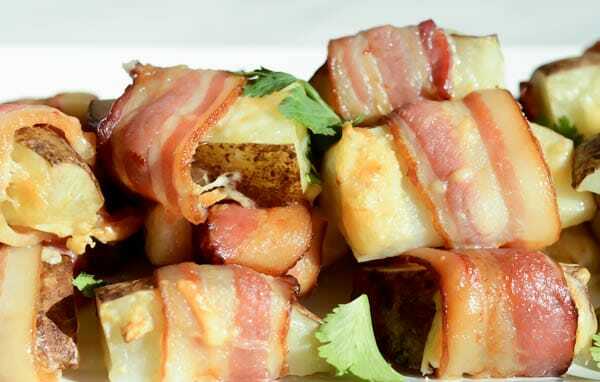 The perfect party or Football Sunday snack – potato wedges topped with mustard and cheese, wrapped in savory bacon. To be honest, I like football. But I don’t LOVE it (like die-hard , I-have-to-watch-it-every-weekend love.) And, to be blatantly honest, most of my love for the game comes from the fact that watching it usually involves adult beverages and delicious food whilst lazing around in comfortable clothes on a Sunday afternoon. Anyone else with me, here? That being said, I’m always a little more concerned with what’s on the menu than what’s on the TV when Football Sunday rolls around. Being the food blogger among my group of friends, the onus usually lands on me to figure out what we will be shoving our faces with while we watch the game. I think bite-size items are definitely at the top of my list, both because they don’t usually require a lot of serving utensils and because it leaves room for more variety – more fun that way! 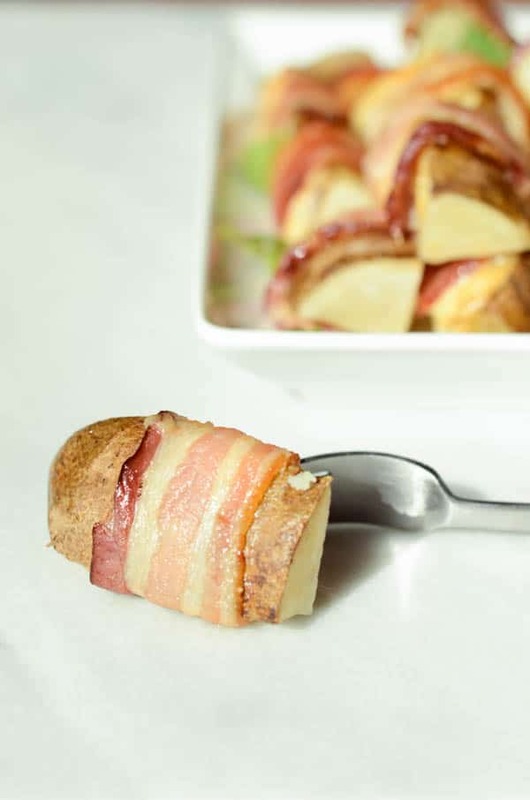 There’s the solid heartiness of the baked potato wedge, the classic pairing of the bacon and cheddar, and the little hit of surprise from the mustard that will make you keep coming back for more. Now, time to start exploring our drink options. I’m thinking there will be some of these, maybe some of these, but don’t be surprised if I come up with an even more festive drink option in the next couple of weeks…Stay tuned! P.S. 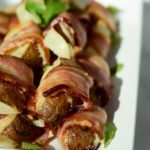 I’m thinking about doing a roundup of Super Bowl recipe ideas from some of my favorite bloggers. What do you think? Is this something you’d be interested in? As always, I love hearing your feedback! 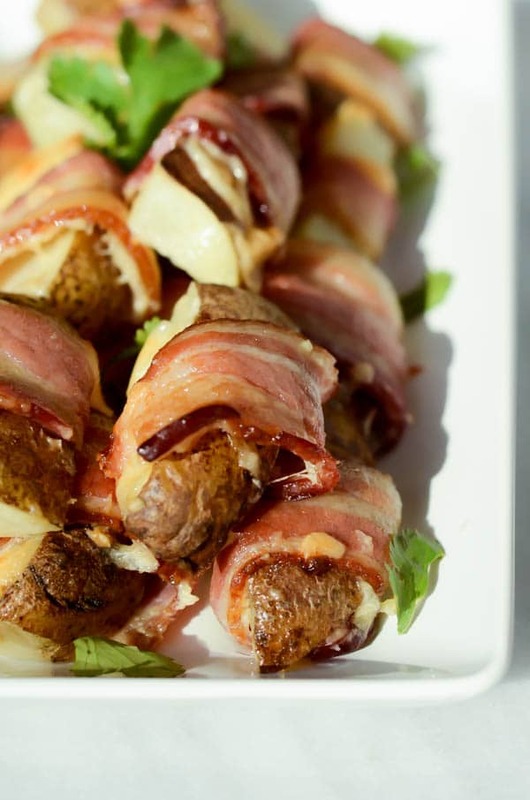 The perfect party snack - potato wedges topped with mustard and cheese, wrapped in savory bacon. Preheat oven to 400 degrees Fahrenheit. Line a large, rimmed baking sheet with aluminum foil. Spray with nonstick cooking spray. 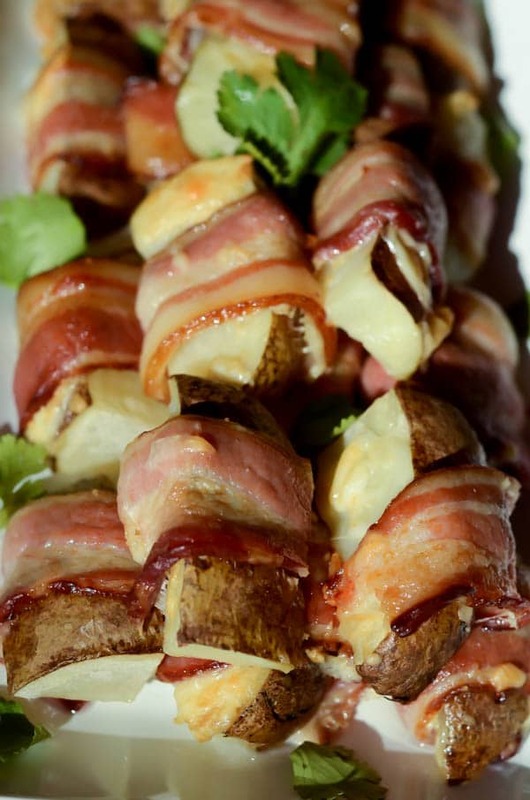 Place wedges in oven and bake at 400 degrees for 25-30 minutes, or until the bacon is cooked. Remove and let cool slightly before serving. Drink Pairing: These are the perfect snacks to pair with just about any type of beer. Stay away from the dark stouts or porters, but everything else (from Budweiser to an IPA to a blonde, etc.) will pair just fine. 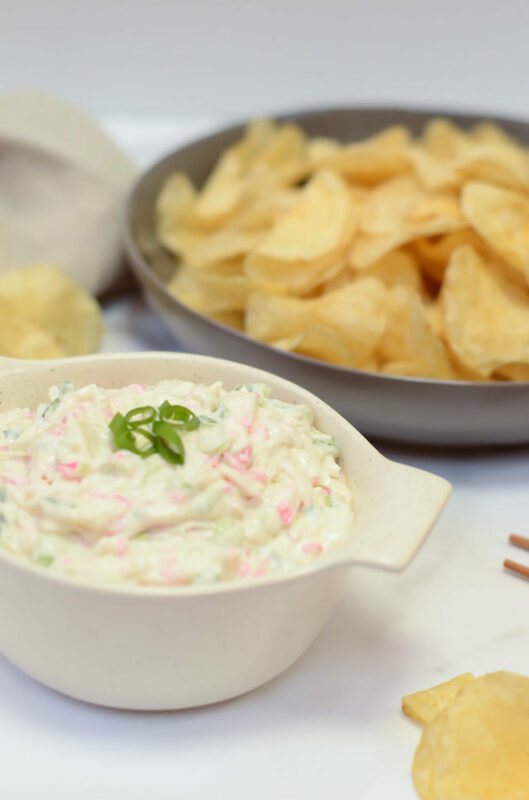 A delicious Hawaiian party dip for your next luau or tropical get-together, where kamaboko (Japanese fishcake) is the star along with green onions and dashi. The perfect accompaniment to potato chips! Today I am sharing one of my favorite Hawaiian party dips and I couldn’t be more excited. I first have to give credit to Auntie Leona, who has been making Kamaboko Dip for us whenever we visit Oahu for, oh, since I can remember? This dish always has to make an appearance when we’re there, or else my brother would never forgive Auntie. Now, my kane and wahine, this is so simple to make. 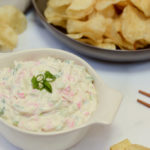 The hardest part will be tracking down some of the ingredients, but I’ve included links to buy the tricky ones and easy substitutions for others so you have absolutely no excuse not to go into your kitchen and make Kamaboko Dip right this instant (or in two days when your Amazon Prime order shows up at your door.) Plus, I’m sharing this recipe a full TWO WEEKS before Super Bowl which means it better be making an appearance in front of the TV on game day (along with these Bacon Wrapped Stuffed Dates, this Caramelized Fennel, White Bean & Gruyere Dip, this Mango Salsa and this Pastrami Pizza.) Just saying. Did I mention this dip is also pretty darn healthy? Whoa whoa, let me back up a bit. 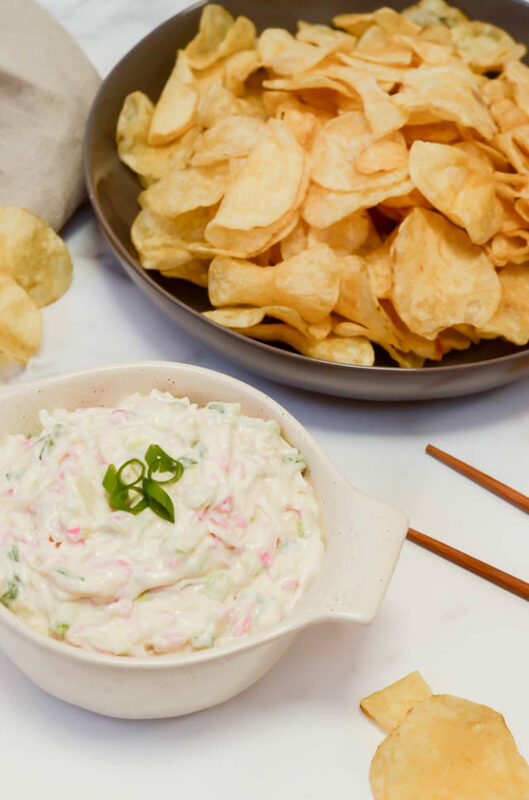 The original Kamaboko Dip recipe, like “Auntie’s version,” is not exactly what we would classify as “healthy” (hello sour cream and mayonnaise!) And if you could care less about your Super Bowl Sunday being “healthy,” then by all means go for the full-fledged version (which I also tell you how to do here), but this blog is all about balance, right? I took the liberty of taking the original recipe and tweaking it just a leeeetle bit to make us feel slightly less guilty for consuming it all in one sitting using Maui onion potato chips as a vehicle from bowl to mouth. Oh, is that just me? You can tell I really love this dip. So, although you may not recognize all of the ingredients, the list is short and simple: Greek yogurt, a tiiiiiny bit of mayo, kamaboko (fishcake), dashi powder and green onions. Shred up the kamaboko, chop up the green onions, throw everything together in a bowl and we’re ready before the National Anthem has even been sung. Even though we’ve “healthied” this recipe up a bit, it still tastes absolutely amazing (if the rate at which the fiancé and I ate it is any indication.) You really cannot tell that we’ve used mostly Greek yogurt instead of the standard version of half sour cream and half mayonnaise. 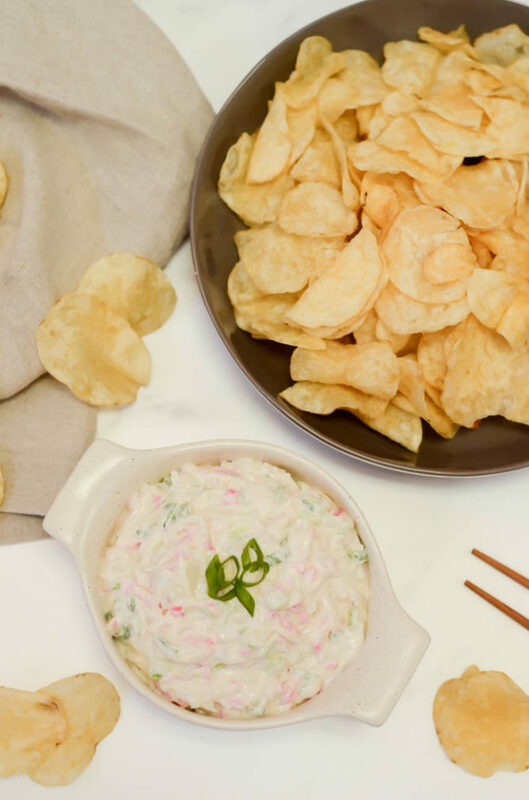 There’s a slight sweetness from the kamaboko, the tartness from the yogurt, and the combined flavor of the green onions and dashi that make this Kamaboko Dip the perfectly balanced, healthy party dish. And, although it is delicious with plenty of healthy “dipper” options (vegetables, pretzels, pita bread or chips, etc.) please, please, please do me a favor and at least give the Maui onion potato chips a shot. You won’t be sorry, even if you have to do a few extra lunges the next day. Happy Sunday my friends! Aloha! 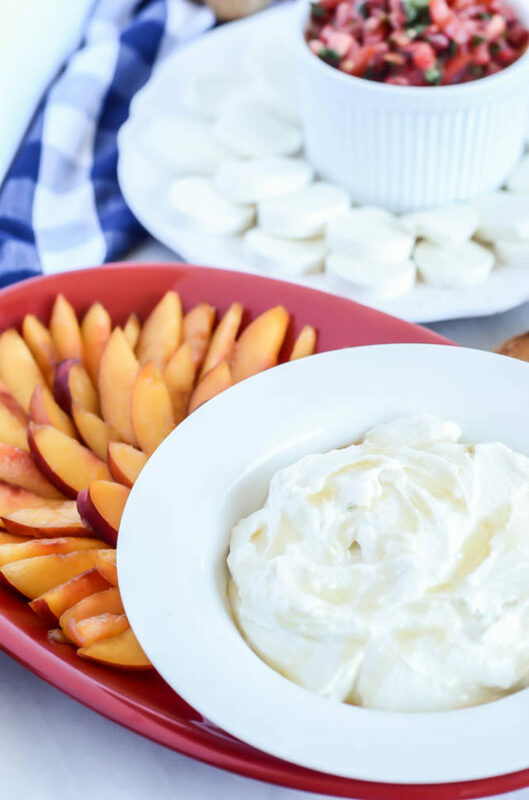 A classic Hawaiian party dip, serve it as an appetizer or side dish at your next luau or tropical get-together! 8 ounces kamaboko, shredded You can use imitation crabmeat if you can't find kamaboko.